Heavy soil and general kitchen spillages was now able to penetrate the pores of the stone leaving it looking stained and grubby.Cleaning using run-of-the-mill household products was proving near impossible and with the customer at a loss as to how to resolve the situation, I was called in to provide the professional attention these tiles so desperately needed. The first order of business was to break down what was left of the old impregnating sealer. To do this I applied Tile Doctor Remove and Go to the floor, it was left to soak in for around ten minutes before being scrubbed into the stone. Remove and Go is a heavy-duty remover for old sealers, adhesive stains and paint splashes that is safe to use on stone, tile and grout. 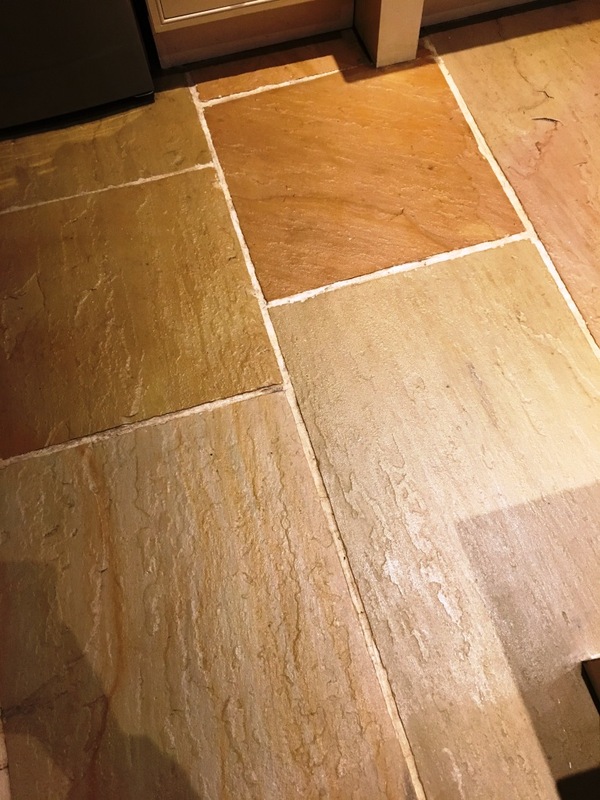 Another product used was Tile Doctor Pro-Clean, which is a powerful high alkaline cleaner which works well on stone and is especially good at cleaning up grout lines. This combination of products helped to eliminate all oil-based stains and day-to-day soils from the stone. Next, using a specialised stone rinse extractor and water, I flushed all the old sealer, cleaning products and resultant soil away. I left the floor overnight to dry completely following the cleaning. 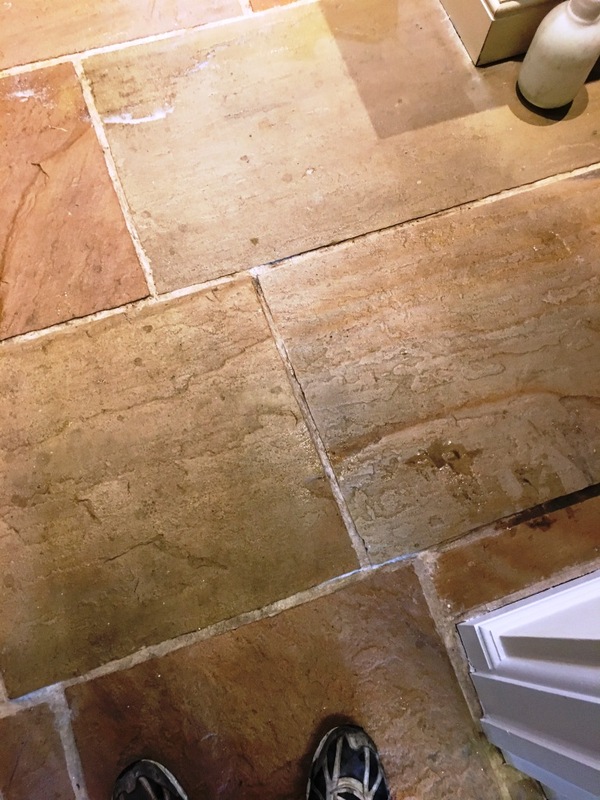 Upon my return to the property I applied three coats of Tile Doctor Colour Grow sealer, an impregnating sealer which helps to protect the stone from spillages and ingrained dirt by filling the pores of the stone and acting as a barrier. This subsequently makes daily maintenance easier. 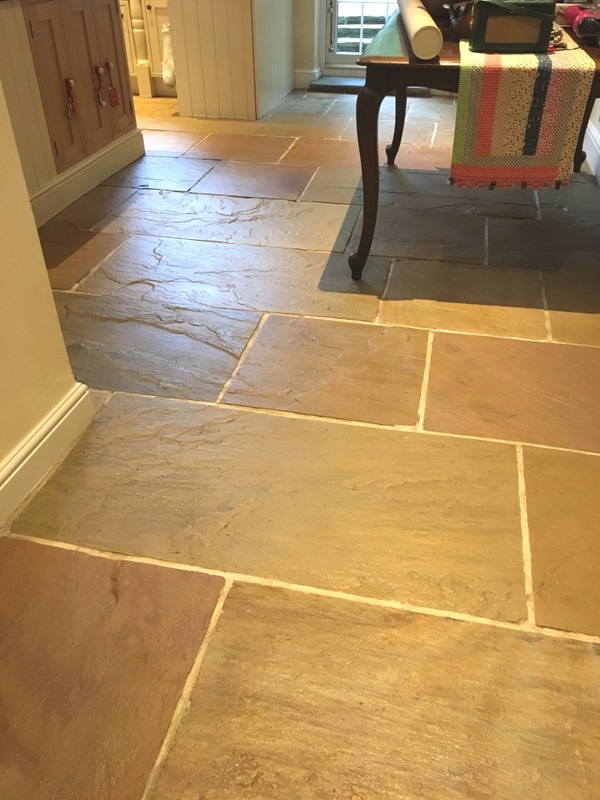 As you may have guessed from the product name, the sealer also enhances the natural colours in the stone. The photos below show just how significant a difference this make to the aesthetic appearance of the floor. 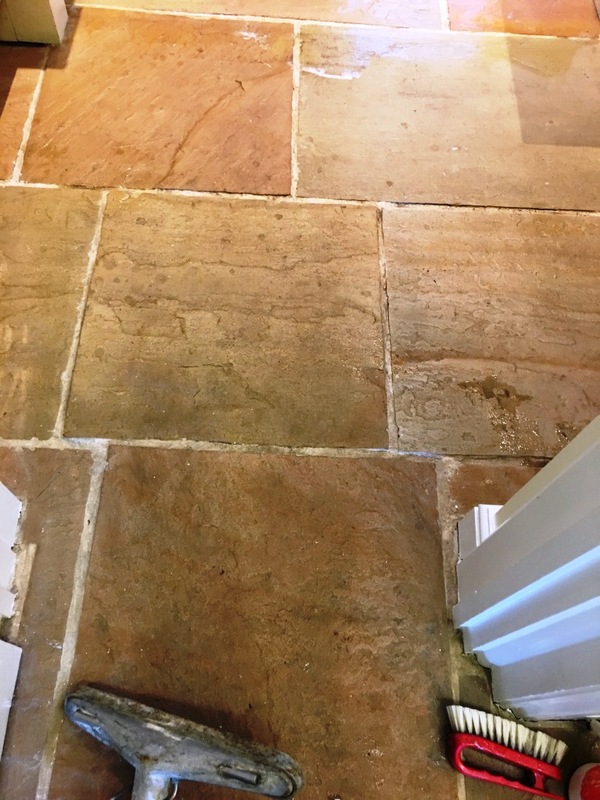 The customer was very pleased with the results and couldn’t quite believe seven years of poor maintenance could be remedied in just two days!